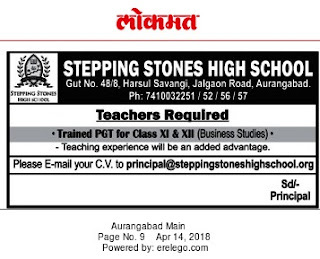 Stepping stones high School, Aurangabad has advertised in THE LOKMAT newspaper for recruitment of Teachers jobs vacancies. Interested and eligible job aspirants are requested to apply immediately.Check out further more details below. 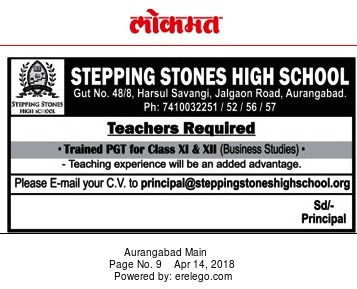 Name of the School: Stepping Stones High School,Aurangabad. Stepping Stones High School was established under Raj Educational and Charitable trust in 2003. It has a widespead campus of 17.25 acers on Harsul-Ajanta Road, approximately 12 km. from the historical city of Aurangabad. (a) Teaching Experience will be added advantage.